The latest addition to the “New Conferry” fleet: the Virgen del Valle II (fomerly Euroferrys Pacifica). Since its expropiation by the government almost two years ago, shipping company Conferry (which connects Margarita and Coche Islands with the mainland) has not lived up to its “New Conferry” billing. Travellers wait for hours inside Conferry’s terminal in Puerto La Cruz, with only a tent for cover. As most of the fleet lacks maintenance, the seven daily trips can’t cover the demand and they’re have to go at a slower pace than usual. The consequences are quite visible: Cases of overbooking in passenger ships and delays of several days in the freight service, which affect the supply of groceries and construction materials for Nueva Esparta State. 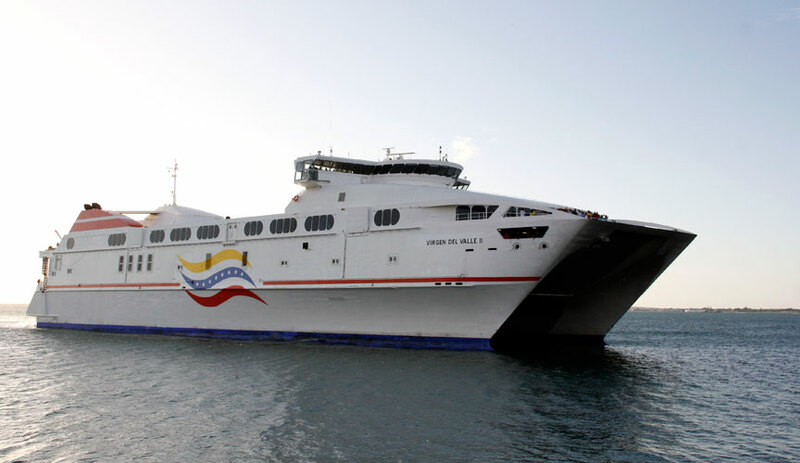 But last month, the “new Conferry’s” management wanted to turn things around with the unveiling of their brand new ship: the Virgen del Valle II, a high speed craft from the fleet of the defunct Spanish company Euroferrys and recently bought by the government. Reports of her maiden voyage were mixed: allegedly the Virgen del Valle II had problems while docking in Punta de Piedras, as the port wasn’t adapted for the new ship’s dimensions. Both the Nueva Esparta Governor Carlos Mata Figueroa and Tourism Minister Andres Izarra strongly denied the report, but witnesses confirmed the incident. But a new ship alone can’t change the negative outlook many have of the “new Conferry” and yet the situation is not expected to change much in the short term. Meanwhile, the other travel option (Margarita International Airport) is also getting pretty overstreched. UPDATE: In an earlier version of this post, I wrote that Conferry was the only company doing ferry services in the area. That was innacurate as several blog commenters have indicated that companies Gran Cacique and Navibus are providing the same service.